The two grape varieties (95% Sangiovese, 5% Merlot) of the blend were fermented differently: the Merlot was given seven to eight days of skin contact at maximum temperatures of 79° in order to extract only supple tannins and preserve the fruity character of the grape’s aromas, while the Sangiovese was given a longer, ten to twelve day maceration on its skins at higher temperatures, 86° which included a soft punching down of the cap of skins in order to increase the complexity of the wine’s flavors and aromas. Ageing took place both in stainless steel tanks and in oak for a total aging period of nine months, followed by a short, two months period of bottle aging before commercial release. Rehydrate the mushrooms in tepid water and chop into small pieces. Boil the water for the polenta and when ready gradually add the polenta flour along with the chopped porcini and keep stirring until ready. Once cooked, spread onto a rectangular baking pan, keeping the thickness at least 1 cm. Place the polenta in the refrigerator to cool and solidify.Cut the pecorino into small cubes. Cut the fully cooled polenta into small disks and place the cheese on top. Place in the oven for 5 min at 180° C and serve hot. *Every polenta has different cooking time and water/flour proportion specific to its particular brand. Consult the directions on the packaging to ensure the best result. This wine was previously given a 85 point rating by Wine Spectator. 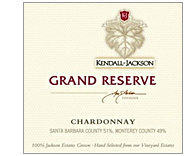 Sourced exclusively from our Jackson Estates Grown vineyards in Santa Barbara and Monterey counties, this release offers the vibrant expression and remarkable depth of varietal character typical of the Chardonnay grown in these outstanding coastal winegrowing regions. In a small bowl, whisk together the mayonnaise, lemon juice, ketchup, mustard, and paprika. Fold in the celery, shallot, and chives. Season with salt and pepper to taste. Cover and refrigerate until ready to use. In a large pot of salted boiling water, cook the cauliflower until crisp-tender, about 2 minutes. Drain in a colander and rinse under cold water to stop the cooking. Let cool. In a medium bowl, toss the cabbage with the olive oil and vinegar. Divide among 6 small plates or shallow bowls. Put the cauliflower in the bowl that held the cabbage. Stir in the crabmeat and rémoulade. Spoon equal amounts of the mixture over the cabbage and sprinkle with the 2 Tbsp. chives. Serve. Heat oil in a large pot over medium heat. Add pancetta and sauté until crisp, about 8 minutes. Transfer to a plate lined with paper towel and allow to drain. Pour off all but 3 tablespoons of the pan drippings. Add onion, leeks, celery, and fennel seeds to pot. Sauté until vegetables are tender, about 5 minutes. Stir in potatoes. Add cream and stock and simmer-stirring occasionally-about 10 minutes, until potatoes are almost tender. Add corn and simmer another 5 minutes or so, until potatoes become tender. Meanwhile, melt butter in a skillet over medium heat. Add mushrooms and sauté until tender, about 5 minutes. Stir in vinegar and thyme. Add this mixture to the chowder. Season to taste with salt and pepper. Sauté crabmeat in mushroom skillet over medium heat until heated through, about 3 minutes. Place a heaping tablespoon of pancetta at bottom of each serving bowl and ladle chowder over. Garnish with crabmeat and parsley. Serve immediately.